Two-time Paralympic champion Danielle Brown has been granted the chance to prove her eligibility for Rio 2016. The British archer, 25, was banned from future disability events in November when qualification rules were revised. Brown suffers from complex regional pain syndrome – giving her chronic pain in her feet – but World Archery said it did not impact on performance. The governing body has acknowledged an appeal by Brown and she will be re-tested in Lilleshall in February. 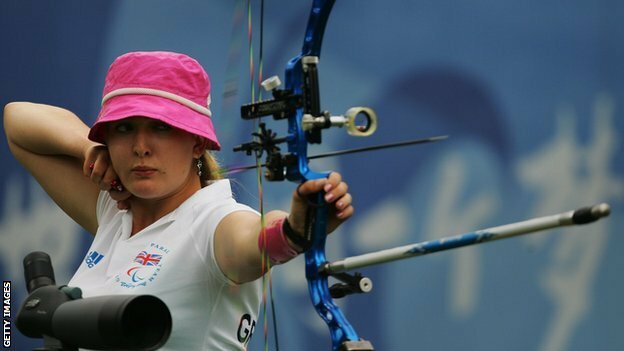 “We are delighted that Danielle will have this opportunity,” Archery GB performance director Sara Symington told BBC Sport. Following World Archery’s ruling in November, Archery GB – the UK’s governing body – was forced to put Brown on a four-month notice period. It means that unless she can secure a reprieve, the London gold medallist will leave the British programme and lose her UK Sport funding in early March. Brown, who competes while seated on a stool to relieve the pain she experiences when standing, said in a statement late last year that she was “bitterly disappointed” with World Archery’s decision to bar her. “My disability affects my life in every way and archery is the one thing that has kept me going,” she said. World Archery will soon appoint two independent assessors – who have not previously worked with Brown – to conduct the re-classification. They will assess her range of movement and medical records before delivering their verdict later in February. Brown won her maiden Paralympic title at the 2008 Beijing Games before securing gold as part of the English able-bodied team at the 2010 Commonwealth Games in Delhi. As it stands, she will be unable to defend the title she won at London 2012 and is due to lose her ability to take part in disabled events from the beginning of April. Brown will compete for the first time since learning of her Paralympic ineligibility at the European Archery Festival in Telford 24-26 January.